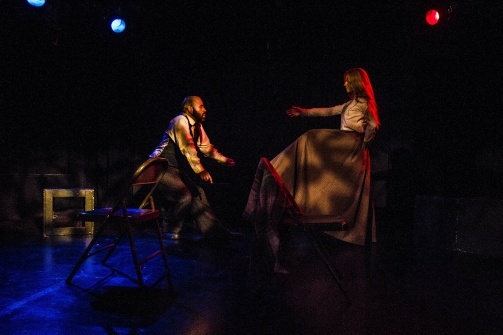 Eric Doss and Jennifer Stepanyk in Poor People. Photo by Andrei Remenchuk. BOTTOM LINE: An empathetic portrait of love and desperation. With clear-eyed compassion and unflinching emotional truth, this adaptation of Fyodor Dostoyevsky’s novel Poor Folk captures the platonic love between two working-class characters in nineteenth-century Russia, following their efforts to survive in a cruel and indifferent world. As in Dostoyevsky’s original, we are introduced to Poor People’s protagonists, the distant relatives Makar (Eric Doss) and Varvara (Jennifer Stepanyk), through their written correspondence. Here, director Irene Kapustina divides the stage in two as they read the letters across separate but parallel worlds. Makar is an overworked copyist for a local magistrate, residing in a squalid boardinghouse kitchen and perpetually hounded by his money-grubbing landlady (played to shrewish perfection by Elizabeth Bove). Rejected by society after her parents’ death and her violation by a former provider, the young Varvara lives and works in a family friend’s seamstress shop while constantly struggling to rise above the gossip and scorn that surrounds her. The relationship forms the sole bright spot in their lives; Kapustina highlights this by directing their rare in-person meetings as silent, softly-lit movement sequences inhabiting the dreamlike middle plane between their workaday lives. The chemistry shared by these two actors is especially evident in these vignettes, and it is fascinating to watch their facial expressions gently shift as they respond to each other. Yet, in the face of such harsh conditions, this love proves as draining as it is redemptive. As Varvara’s financial and physical security grow increasingly precarious, Makar drives himself deeper into ruin for her sake. Ironically these actions, and Varvara’s association with Makar, only worsen her reputation and place her in more urgent danger. Desperate to escape town and restore her honor, Varvara accepts a marriage proposal from a controlling but wealthy landowner (Alan Altschuler), believing it to be her best option. Even then, Makar comes to her aid, reducing himself to holed shoes and a buttonless overcoat to fund her betrothed’s demands for wedding lace. The play’s final image, pairing a shivering, half-naked Makar with a resigned, bridal-clad Varvara, is particularly arresting. Perhaps most heartrending is the empathy we feel for these characters, even as their actions doom the happiness they share. Makar’s devotion to Varvara seems near-suicidal, but it stems from a genuine love for her and functions as the only meaningful element in his life. Given her circumstances, neither Varvara’s need for Makar’s help nor the choice that takes her from him seems wholly unreasonable. Poor People thus asks us to examine how our environments shape our decisions, and to question a society which condemns its poor and forces them to choose survival over humanity.